What exactly is a VPN router ? And why would you possible want to use one, as a method for using you VPN ? 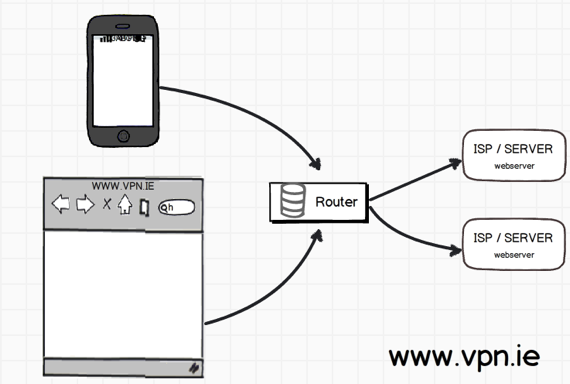 By using a VPN router, you can secure your whole network, from just one source. Seeing as all your network traffic goes through your router, before leaving your home, having a router to save you having to configure each device connected to the internet. This router, the Cisco Linksys E4200, is an example of one such router that can be configured to direct your web traffic to a VPN server. Here is a typical network setup. On the left we have a mobile device and computer connected via WiFi to a wireless router. The router in turn connects to different web-servers depending on what domains / webpages you want to visit. The web-server for Hulu is located at a different location (IP address) to where the server of the BBC is. Depending on what domain you type in, the router will fetch that webpage. Here we add an intermediary server. 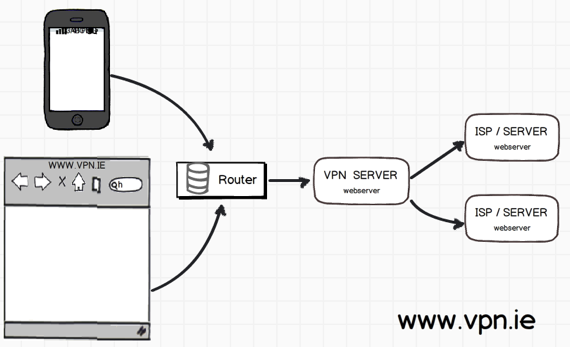 In this example the intermediary server is a server that’s controlled by your VPN provider. By configuring your wireless router, instead of it requesting Hulu or BBC directly, these requests are sent first to the VPN server, which in turn connects to Hulu or BBC. It can be the case that the VPN server is located in a different country to where you are, but to websites like Hulu or BBC you will appear as being in the same country as the VPN server, and not where your router is physically located. It’s also possible that your VPN provider will have more than one VPN server which could be located in another country. This means that you can change the location that websites will see you coming from, which would further extend your anonymity online. To see if your router is compatible you would need to check the manual, or check around in the settings. If your router doesn’t support a VPN, there might be still an option to use a DNS service, a so called Smart DNS service, which doesn’t provide encrypted traffic rather it can just tell the websites that you are in a different country when it comes to do it’s DNS lookup. If you don’t use a VPN router, you will need to configure each device, which can get to be a big hassle if there are iPads, iPods, iPhones and other devices that you want to use your network and your VPN service. A router will save you some configuration and will work for everyone on the network as soon as they connect, with the need to have any extra settings. This type of VPN setup is particularly useful for those people who don’t want to worry about all the technical steps. This is a good question, thanks for your submission Martin in Milan, Italy! Since 2011 Paul has run VPN.ie, a company that aims to protect and / or anonymise your identity online. Together with partners VPN.ie has access to servers in over 60 countries. 5 Responses to "VPN Router"
How would I know if my router is enabled to use a VPN ? Or do I have to buy a new one ? I currently have one from NetGear and I don’t see anything in the config to change the DNS settings. Am I out of luck ? Hi Sarah, you can either check the manual or check the control panel for your router. Sometimes it can be found under the ‘advanced settings’. If you don’t have this functionality available you might get away with using a Smart DNS service. It all really depends on what you are trying to do. Smart DNS can unlock content, while a VPN encrypts your traffic passed your ISP, and then can unblock content. Recently my wife started working at home which requires her to connect using a VPN connection. However, now it is “interfering” with my VPN connection to the point where I get disconnected or simply non-responsive. I have the router listed in the this blog and was wondering if it is something to do with a NAT configuration. I see a lot of articles talking about IP conflicts but I am not sure what they are alluding to. Hi Will, thanks for stopping by. There shouldn’t be any reason that another VPN on the network would cause an issue. I guess you are running the VPN on the router, and your wife is running the VPN on her computer. Is there anyway you can let her traffic bypass the VPN and go straight to the internet ?